Ahead of Fundraising Week, Emma Revie, the new CEO at The Trussell Trust, shares her insider insight into the charity's culture and what makes a great fit for its fundraising team. The Trussell Trust supports a network of 428 foodbanks across the UK. Each foodbank is an individual charity supported by the local community, but also supported by us as a national charity, campaigning for change as one national voice and offering practical help to projects on the ground. The work of the foodbank network is rooted in community but has national scale – when members of our network come together we can offer really valuable, robust, UK-wide evidence about why people are being left without enough money to cover essential costs. With that evidence, and the authority of over 40,000 volunteers across the country, we can talk meaningfully about what changes are needed so we can work towards a future where no one needs a foodbank. It’s completely unacceptable that anyone is forced to turn to a foodbank. Working towards a UK where there’s no need for foodbanks won’t be easy and we won’t be able to end hunger alone. 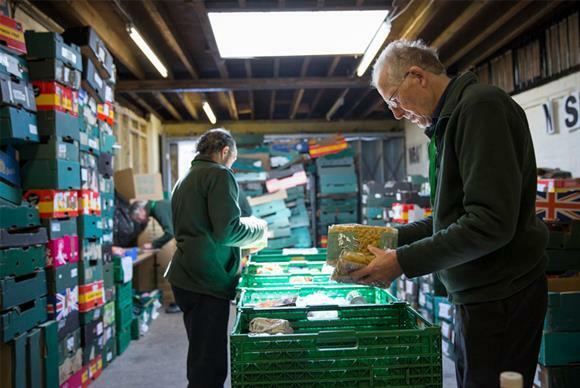 However, as a national foodbank network we have a responsibility to provide the best service possible to people who come through the doors of foodbanks in our network, whilst at the same time working to ensure foodbanks don’t become a permanent institutionalised feature of British society. What exciting projects is the fundraising team working on? We’ve just announced an exciting new partnership with ASDA, ‘Fight Hunger Create Change’, which will provide grant opportunities directly to foodbanks in our network. In terms of generating new income, we established a community fundraising team last year, and they’ve pulled together a jam-packed calendar of fundraising events and activities throughout the year. We’re also investing more in donor recruitment and development – and aiming to integrate fundraising with food-raising and campaigning. What challenges are fundraising professionals facing? The practicalities of GDPR have been (and remain!) a challenge, but an important one to get right. We’re making a real positive out of this though – launching a new Supporter Promise for example, and structuring our teams so that we’re in a better place to communicate more effectively with supporters – being totally transparent about what we do with their donations and how their support makes a difference. What kind of people are the best fit for your fundraising team? Our team has a mix of people who have worked in charities and people from a whole range of other sectors - what unites us is a belief that we can create change. The way each supporter of our work interacts with us can be really complex because there are so many different ways to support, so it’s really important that our team works collaboratively together and with our operational and policy teams. You’ve got to look after your people. Everyone who works at The Trussell Trust has their own personal development programme, we invest in specialist training where helpful, and we try to make use of our corporate partnerships as well. It can be hard when things are busy but we try hard to enshrine time for regular one-to-ones and informal chats about development too. What are your top tips for fundraising job applicants? Don’t be put off if you don’t have lots of charity sector experience! If you can articulate a concept, harness people’s enthusiasm, and bring people on a journey, sharing a vision, then you can pick up the technical things. The drive to create change can’t be learnt. What does the future have in store for fundraising careers? Gone are the days when you could be a fundraiser for hire - you’ve got to be much more directly involved and joined up with operational teams to make sure you’re credible and you’re securing the right kind of support for your charity. Everybody is a potential fundraiser.